This Catamaran Leopard 4600 and his crew will take you to the discovery of Belize, with its famous coral reef and even more famous Blue Hole. 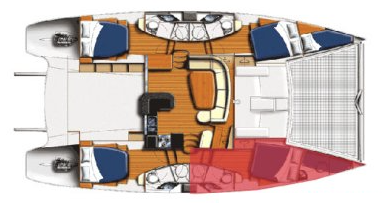 This Leopard 4600 welcomes up to 6 passengers on board to explore the Belize. This Leopard 4600 available for yacht charter in Belize, is fully equipped with air conditioning, equipped galley, generator and also fishing equipment, kayak and DVD for leisure. This crewed catamaran is available for yacht charter with a base price of 9 900 $ (approximatly 8 779 €).